NEW YORK, June 1, updated June 2 -- Joe Biden is out of date. How else to explain his comments on the New York Yankees and Governor David Patterson at Monday night's Democratic National Committee fundraiser at the Loews Regency in midtown? Biden called Patterson, currently with a less the 15% approval rating, "your once and future governor." He then joked of the Obama administration that "unlike the Yankees, we got out of the gate pretty quickly." But the Yankees are now in first place in the American League East, and won again on Monday night in Cleveland behind Joba Chamberlain. When was Biden's speech written? 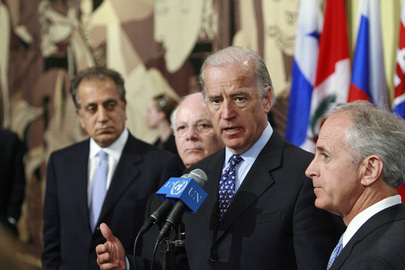 Biden and Patterson will be joined by Deputy Treasury Secretary Neal Wolin and a panel of businesspeople on Tuesday at Pace University in lower Manhattan to praise the Recovery Act as creating opportunities. Yeah, JP Morgan Chase was able to use TARP funds to buy Bear Stearns and Washington Mutual. Bank of America got Merrill Lynch and Countrywide Mortgage. Among the most dubious recent ruling in this flurry of bailouts was the Federal Reserve's decision that General Motors not only has legal control of GMAC -- that is, General Motors Acceptance Corporation -- by on paper reducing its investment to just below ten percent. This was done so that GMAC could be converted into a bank holding company and be given TARP bailout funds. Now what? President Obama's envoy to Pakistan and Afghanistan Richard Holbrooke, according to the State Department, is headed to Pakistan "to get a sense of how things are on the ground and how we can better, you know, formulate our own assistance with regard to, you know, the IDPs and others who have been affected by what’s been going on in Swat." If so, he'll know more than the United Nations, which has ordered its staff other than in Islamabad to stay in their homes due to threats. Inner City Press: There were reports that over the weekend the UN told its staff members not to go to their offices in Pakistan through the country, and that now, only in Islamabad. I understand you don’t speak about the exact threat level, but how does that impact the UN’s work and is there an idea of sending them back in places other than…? Is it accurate that only in Islamabad and that only essential personnel are working today? Spokesperson Montas: Well, I understand that it was a limited decision. It was based on some security concerns and, as you said yourself, I am not at liberty to give you the security levels in any given UN post. I can tell you that they did do their work from home and we’ll try to get an update for you on where the situation is right now as soon as I get back to my office. But twelve hours later, no update has come. Update: At the next day's noon briefing, Ms. Montas criticized Inner City Press for not running the UN's comments (while confirming her participation in a May 8, 2009 meeting at which senior UN officials discussed hiring outside legal counsel to threaten three publications, and to complaint to Google News about Inner City Press, click here for that. Despite all that, having received a phone call from an FAO worker just back from Pakistan who said that despite security fears some are still out in the field, we report that here, hats off. Watch this site. UN Tells Press to Pay $23,000 For Space to Cover It, Sources Say, Scant UN Media Coverage to Further Decrease? UNITED NATIONS, May 29, updated June 1 -- The press would for the first time in UN history be charged for space in UN headquarters under a plan announced in a closed door meeting on May 28 by officials of Secretary General Ban Ki-moon. Since Mr. Ban assumed the position 29 months ago, CNN has stopped covering the UN on a daily basis, and the Washington Post is mulling closing its UN bureau. Nevertheless the chief of the UN's Capital Master Plan renovation Michael Adlerstein told press corps members that in the "swing space" for media for the next three to four years, work spaces like the ones they have now for free will require them to pay $23,000, or even $70,000 in the case of broadcast media. The same amounts or more will be charged again once the UN Headquarters building is renovated, sources in the meeting told Inner City Press. Despite multiple requests by Inner City Press, neither Adlerstein or his spokesman have commented for this story. Already, Mr. Ban's administration receives less press coverage than his predecessor Kofi Annan, who never charged the media. What is not known is if the move to charge the media tens of thousands of dollars comes from and is approved by Mr. Ban, or is a unilateral project of Adlerstein and his boss, Under Secretary for Management Angela Kane. Last summer, Inner City Press was provided by a whistleblower with a copy of a Department of Management internal memo reflected that Ms. Kane wanted a review of public institutions similar to the UN to see if they charge the media for space. As Inner City Press reported on July 17, 2008 , in a July 15 memo, Principal Officer Lena Dissin said that Angela Kane, the then-new Under Secretary General for Management, "has asked us to quickly get some benchmarks from other organizations to see what facilities if any they may make available to the press," and on what basis. But neither the U.S. State Department nor City Hall in New York charge money. While Kane has refused to answer emailed questions, Adlerstein in the hallway of the UN months ago told Inner City Press that the rationale for trying to charge, if they did, would be that for the first time the UN is having to rent a lot of outside space, and so is looking at costs more closely. Apparently, though, the UN is not looking at precedents, neither of the fact that no previous UN Secretary General charged money to the press, nor that the State Department, White House and City Hall do not. In fact, the UN is directed by General Assembly resolutions that are now sure to be cited to make it easier, and not harder, for the press to cover it. On May 29, Inner City Press telephoned Adlerstein's spokesman Werner Schmidt, whose voice mail message said his line was busy. Inner City Press left a detailed message about the media charges and asked for confirmation or denial and comment, on deadline, before noon. 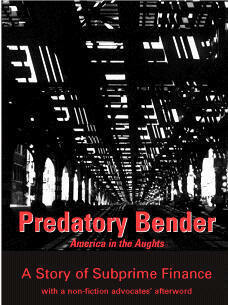 No response was received then or even by 3 p.m., so Inner City Press telephoned Adlerstein's line. His secretary said he was in a meeting for the next hour. 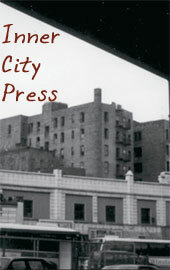 Inner City Press again explained the question, and that a response was requested. He will call you back in an hour, Adlerstein's receptionist said. Twenty four hours later there has been no response. Ms. Kane has previously told Inner City Press, in writing, that she had no time to answer such questions, and to ask everything at the UN's noon briefing. But on May 29, Deputy Spokesperson Marie Okabe said from the outset that she would take only two questions from the entire press corp, including on charges that the UN covered up 20,000 civilian deaths in Sri Lanka. According, we publish this story now. The explanation above is apparently necessary, because within the embattled Department of Management Inner City Press is informed of a strategy to lash out at the Press for not obtaining comments in advance. But when high officials say they have no time to answer questions and to ask at the noon briefing, at which it is said that only two questions will be taken, it is not the Press' fault. In fact, related to the anti-press strategy reported on above, simply in the past four day week, the UN has neglected to provide follow-up answers promised on at least two (mis) management issues. 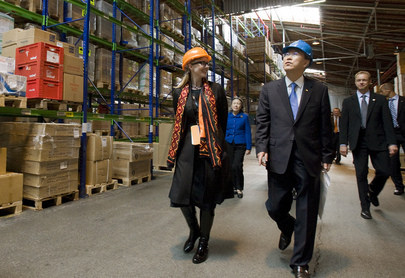 Inner City Press: the Secretary-General went to UNOPS in Copenhagen. There, not long ago, there was a story in I guess, the Washington Post, talking about this UNOPS Director problem in Afghanistan and missing funds and the dispute between USAID and the UN about the return of funds that were improperly diverted to other uses. Is this something that either he raised in his speech at UNOPS or in speaking with Mr. Jan Mattsson? What’s the UN system done since that report came out about missing money? Inner City Press: Marie, I want to ask a question about a contract that the UN is entering into for outside legal counsel to defend a claim by PCP International. They’re paying an outside legal firm, it appears, $500,000, and then Headquarters’ committee on contracts now shows there are significant irregularities in it. Can you explain on what basis? Doesn’t the UN have its own legal department? When does it hire outside firms and, in this case, if you can look into it, why were the safeguards of procurement overridden? Deputy Spokesperson Okabe: This is the first I hear of this, so we’ll have to look into it for you. Currently, such documents whether about the UN's $250 million no-bid contract with Lockheed Martin or irregularities in the UN Medical Service, or even Inner City Press' acknowledged exclusive this week of a leaked copy of the draft Security Council resolution on North Korea can be given to the Press in a closed-door office without monitoring by the UN. Under the new plan of Adlerstein and Kane, absent $23,000, this would not be possible. Even now, a person the UN has suspected of being the Medical Services whistleblower has had her e-mail "broken into" by the UN and checked, including to read any communications with the Press. Inner City Press asked at the noon briefing for the UN's comment on the legality of its treatment of the person, but no answer has been given. Welcome to the UN. We will report on any UN responses belatedly received. 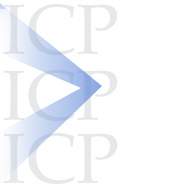 Question : Marie, I want to ask a question about a contract that the UN is entering into for outside legal counsel to defend a claim by PCP International, they’re paying an outside legal firm, and it appears, $500,000, and then Headquarters’ committee on contracts now it shows there are significant irregularities in it. Can you explain on what basis? Doesn’t the UN have its own Legal Department? When does it hire outside firms and in this case, if you can look into it, why were the safeguards of procurement overridden? [Answer] The legal contract referred to in the question was bid out on a competitive basis after appropriate due diligence. The contract was recently signed. 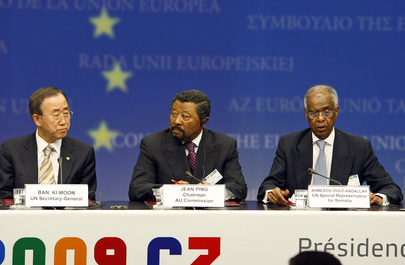 The acquisition process was reviewed by the Headquarters Committee on Contracts (HCC) and as such the appropriate safeguards and internal control measures, as per the Procurement Manual, were undertaken to ensure that the procurement case is compliant with the established rules and regulations and a best value for money outcome was achieved in the interest of the Organization. As the release of commercial contractual information is a potential for litigation, it is inappropriate for the UN to add any further comment. The question was based on internal UN documents being provided to Inner City Press by a whistleblower, and we'll have more on this. Meanwhile, the requests for comment directly to Michael Adlerstein and the CMP on May 29 were not responded to on June 1, either. Watch this site. UNITED NATIONS, May 29 -- Testifying about Somalia to the U.S. Senate on May 21, a representative of Oxfam said that "the United Nations Development Program gave direct financial support for police salaries and some of these police were implicated in serious human rights abuses." On May 29, Inner City Press asked the Somali Transitional Federal Government's foreign minister Mohamed Abdullahi Omaar to respond. "I'm appreciat[ive] of that worry," he said, saying that the "concern.. speaks on behalf of the Somalia individuals who suffer." Video here, from Minute 21:36. But when Inner City Press less than an hour later posed the same human rights question to the UN's envoy to Somalia, Ahmedou Ould Abdallah, he called the question "irresponsible," the questioner an "accomplice to.... genocide" and told Inner City Press that "there will be more killing and anarchy [and] you will be responsible." Video here, from Minute 19:44. Inner City Press pointed about that it was Oxfam's testimony, and that is seemed fair to ask how the UN is making sure the funding it gives in Somalia supports and does not contravene human rights principles. Ould Abdallah, who previously said that the press should not report on the killing of civilians by African Union peacekeepers, disagrees. He said the Somali police should be paid even if some "stole money money" or committed "abuse." This is not the UN policy. But the UN has become so out of control that no one dares to reign Ould Abdallah in, or even tries. When Ould Abdallah attacked the media who reported on African Union peacekeepers firing into a crowd of civilians in Mogadishu, and compared these media outlets to Radio Milles Colines which stoked genocide in Rwanda, both Human Rights Watch and press freedom groups demanded he issue a retraction. Inner City Press asked about it at the UN in New York, and was later told by senior UN officials that Ould Abdallah had been told to retract it by headquarters, but had not do so. So much for accountability. Emblematic is the lack of answers on how Ould Abdallah, according to a joint Somali - Kenyan filing under the Law of Sea's Continental shelf process, arranged for assistance from Norway and its Petroleum Directorate. Inner City Press wrote about this and asked the UN and Ould's spokesperson Suzie Price, but never received an answer. On Friday, the question was put to Ould Abdallah and he said he is "no specialist," that he was unfamiliar with the filing that states that he prepared it. "Ask Norway," he said. Video here, from Minute 12:30. Inner City Press already has -- click here -- but Ould Abdallah's non answers on May 29 only raise more questions. "initiated the preparation of preliminary information indicative of the outer limits of the continental shelf of Somalia beyond 200 nautical miles... In the preparation of this material the SRSG accepted an offer of assistance from the Government of Norway... Both the Royal Norwegian Ministry of Foreign Affairs and the Norwegian Petroleum Directorate have been involved in the preparation... All of the expenses related to the preparation of the present submission have been covered by the Government of Norway." Norway, of course, is a major oil producer. Absent safeguards that do not appear to be in place, it is viewed as a conflict of interest for Norway to pay for and prepare a filing about drilling rights for an African country described as having no government. And yet little has been said, and the UN has accepted the filing. Call them pirates of the pen. Find below the response to your question at yesterday's Noon Briefing on UN support for police personnel of the Transitional Federal Government, (TFG): The UN Development Programme has provided training to civilian police officers in Somalia, under internationally approved guidelines with emphasis on community-based policing practices. So far, 2,775 police personnel have undergone this internationally approved training by UNDP for the TFG. These are the only police personnel who are eligible for the payment of stipends which is paid according to strict human rights and financial accountability standards. Some donors are supporting payment of stipends to UNDP-trained police. So who are the donors? It appears that Ould Abdallah, whenever he doesn't like or doesn't want to answer a question, particularly a financial questions, calls the questioner an accomplice to genocide. And so it goes at the UN. UNITED NATIONS, May 28 -- The status of interred civilians in Sri Lanka has sunk so low at the UN that even for Secretary General Ban Ki-moon to be invited to brief the Security Council on his recent fly-over the conflict zone has resulted in opposition from China, Russia, Viet Nam and others. In a closed door Security Council meeting Thursday, these countries and others suggested that since there is no more conflict, Ban should not brief the Council but rather the General Assembly. It was arranged that Ban will meet private with Russia and Turkey, the Council presidents for May and June. 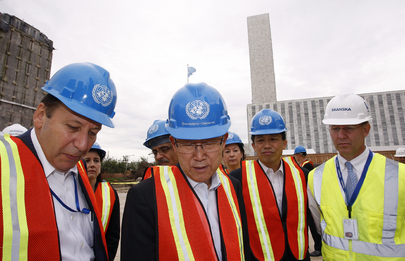 At most, Ban will brief the Council in the UN's basement, put on par with Sri Lanka's Ambassador to the UN. said that Secretary-General Ban Ki-moon had regrettably undercut efforts to produce a strong resolution with his recent comments in Sri Lanka. Ban publicly praised the government for "doing its utmost" and for its "tremendous efforts," while accepting government assurances, repeatedly broken in the past, that it would ensure humanitarian access to civilians in need. Ban also distanced himself from strong language used in April by the UN under-secretary-general for humanitarian affairs, John Holmes, who warned that the fighting in Sri Lanka could result in a "bloodbath." Unlike Pillay, Ban also failed to press for an international inquiry. "Secretary-General Ban shares the blame for the Human Rights Council's poor showing on Sri Lanka." Nearly 24 hours after this press release went online, Ms. Obake said that the UN hadn't seen it. Video here, from Minute 11:50. She said however that on these issues "the Secretary General has been very clear in public, perhaps more clear in private." Perhaps. UN's Ban looking up - toward a Security Council or GA "informal dialogue"? The Secretary-General has repeatedly said wherever serious and credible allegations are made of grave and persistent violations of international humanitarian laws, these should be properly investigated. In addition, the Office of the High Commissioner for Human Rights, while noting that the Human Rights Council will not agree to set up such an inquiry at this point, says that more information will come out, more evidence will emerge about what did and did not happen. So an international inquiry could still happen further down the line. The Office also said that international human rights law is quite robust -- there are different ways and means to get to the truth and provide some measure of accountabilty. Sometimes it takes years, but this Session and this resolution do not close any avenues. But Ban's speech upon arrival in Sri Lanka on May 22, and his Joint Statement with the government exiting the country the next day, speak for themselves. In a briefing primarily about Pakistan, Inner City Press asked the UN's top humanitarian John Holmes if the doctors who remained in the conflict zone to offer treatment and casualty figures are still being detained and interrogated by the government of Sri Lanka. They are, almost Holmes said they have received ICRC visits. Yesterday the head of the ICRC said that his Red Cross has no access to some Sri Lankan "interment" camps. Holmes said that he disagrees. Who is one to believe? Watch this site.